Reduced weight from previous format. Simplified, yet striking, visual design. Unmatched road feel with a touch of stability. Also available in a women’s specific version. Yet another $5 price increase. Last is still too curved. A slightly tweaked, blisteringly fast shoe that still maintains a touch of correction. A good value for the race minded runner-even with another price increase. Fans of the Wave Musha 4 should not be disappointed. Moderate over pronators looking for an ultra-performance racer for 5K to 1/2 marathon distance. Neutral runners and milder over pronators could take this shoe for 26.2 and beyond. The Wave Musha 5 could also generate some interest from minimalist runners. The Wave Musha 5 can trace it’s lineage back to the original Wave Revolver series. As such, it has consistently maintained its spot in the rather narrow market for racing flats that offer some measure of protection from over pronation. This year’s Wave Musha 5 debuts with some slight upper tweaks while maintaining a carryover midsole from last season’s shoe. 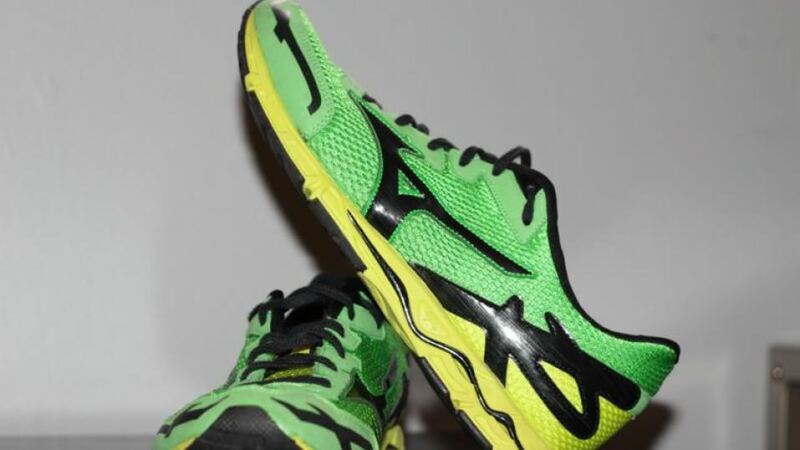 The Mizuno Wave Musha series has always favored a color palette with wilder tastes in mind and the Wave Musha 5 comes to the party dressed in an electric lime, yellow and black color way. While the overall visual design is very simple and slightly 1970’s in flavor, the aggressive colors make for an outstanding visual impact. Looks aside, the Wave Musha 5 comes with a retooled upper that presents a stripped down design philosophy free of almost all overlays. As usual with Mizuno, the Wave Musha 5 has kept the same midsole for a second year. The fit of the Wave Musha 5 is low slung and feels much the same underfoot as its predecessor, the Wave Musha 4. With the upper change, the new Wave Musha 5 sizes in the same in the heel with just a touch more width in the mid foot and toe box. The Wave Musha 5 utilizes a carryover midsole from the Wave Musha 4 constructed with the same premium AP+ midsole foam and wave plate. 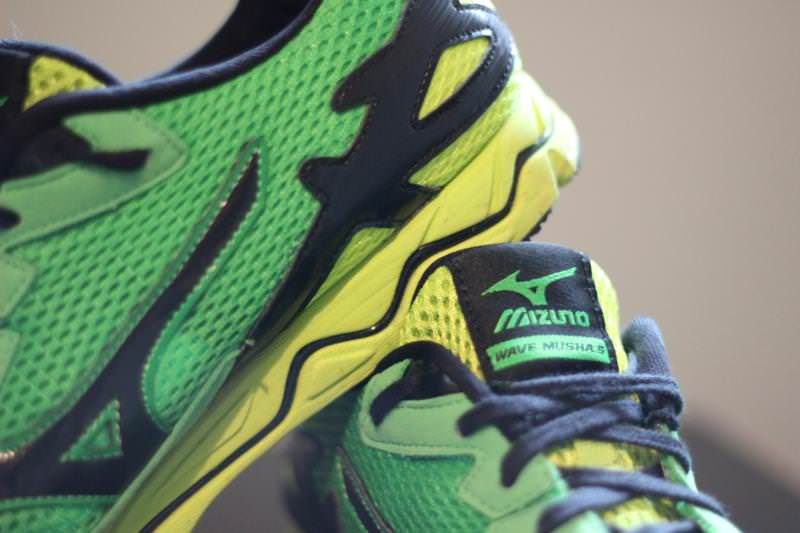 The heart of any Mizuno running shoe is the Mizuno Wave. This is a plastic device inserted into the midsole and tuned for different applications. The idea is to give the shoe a durable “suspension system” that combines stability, responsiveness and cushioning. The Wave Musha 5 uses a single density wave plate that begins at the heel and travels all the way to the first forefoot flex groove. The lateral heel area has ports left open around the wave plate to help the shoe release laterally more than it does medially. This adds to the stability of the shoe and helps smooth out transition. 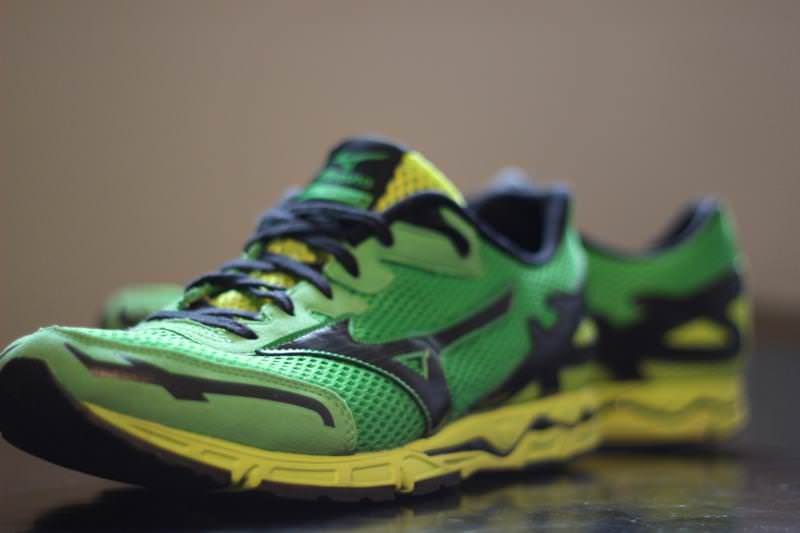 The Wave Musha 5’s last is rather dramatically curved and features Mizuno’s high durability X10 carbon rubber in the heel and blown rubber up front. The Wave Musha 5 also features a flat outsole with no arch cutout for increased ground contact and a slight bump in stability. Here’s where Mizuno put all the focus on the update of this shoe. Clearly, the focus was on getting the most done with the least amount of materials. Beginning with a retro design motif, Mizuno deleted every overlay from the Wave Musha 4 and replaced them with a vintage looking suede type eyelet row and toe box cap. 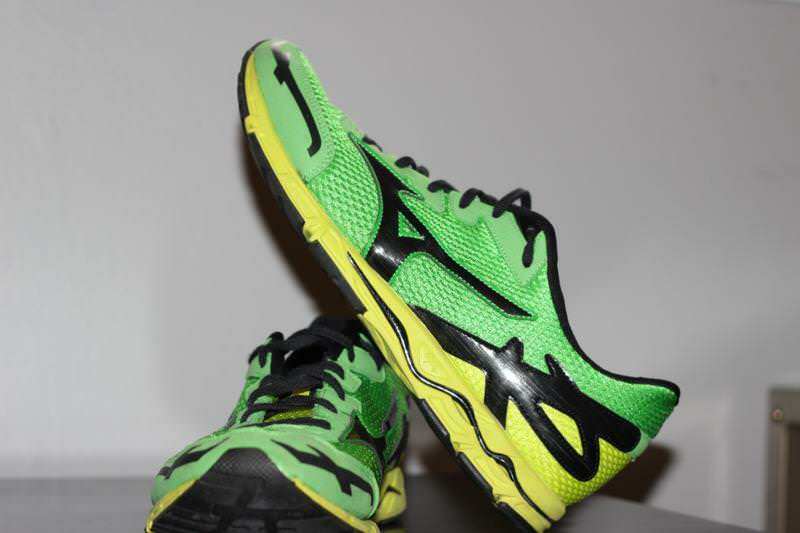 Only the Mizuno Runbird and the heel overlay are made of thermoplastic material. The Mizuno Runbird pulls double duty as brand logo and overlay by connecting to the midsole and the eyelet row right at the mid foot. The heel overlay no longer connects to the eyelet row and now wraps itself around a slightly more flexible heel counter. The balance of the upper contains standard mesh that is just a touch softer and more flexible than in the previous design. Mizuno has also deleted the “dazzle” laces and replaced them with a slightly smaller type of flat lace. The tongue feels thin just as before but now sports a woven nameplate instead of the earlier style embroidered logo. The interior collar lining seems identical but the Wave Musha 5 now gets an Ortholite style sock liner to replace the older foam version. In past races I’ve had some really good luck with the Wave Musha series. This season I raced the Wave Musha 5 in the 5K, 8K and 10K. Last year I had a new 5K personal best and this year I was able to shatter my previous bests in the 8K and 10K. While I didn’t break my 5K yet in the Wave Musha 5 I’m hopeful to have some really strong 5K’s in the shoe this summer but those will happen some time after this review is published. The Wave Musha 5 is pretty much my dream short distance racer. It has blistering transition, a powerful ride and great road feel. The only thing that bothers me about this shoe is its excessively curved last. The shoe almost looks like a banana when you flip it over! A last this curved is really only appropriate for a neutral shoe and I like the straighter last shape found in the Wave Musha 3 much better. The Wave Musha 5 is so curved that it leaves a good deal of my mid foot hanging off the inside of the shoe. Thankfully though, the new upper is brilliant in both design and execution. The mesh is quite breathable and the shallow fit and wider toe box works well in concert with my feet. Also, there are no hidden “underlays” to chafe my feet as in the Wave Elixir 8. As a moderate over pronator, I feel like this shoe is best suited for 1/2 marathon distance or less. Personally, I wouldn’t take it past the 15K because I like a bit more shoe for anything over that. The shoe can handle it for sure but my feet are just too flexible for me to even attempt anything over that distance in a shoe as minimal as the Wave Musha 5. Thanks to the revised upper the Musha gets a bit lighter on the foot and heavier on the wallet. Another $5 price jump pushes this shoe into the $90 bracket. Even though, I still think it’s a great choice for a moderate over pronator who is interested in pushing the envelope of their physical capabilities on race day. Oh, and it looks killer too. 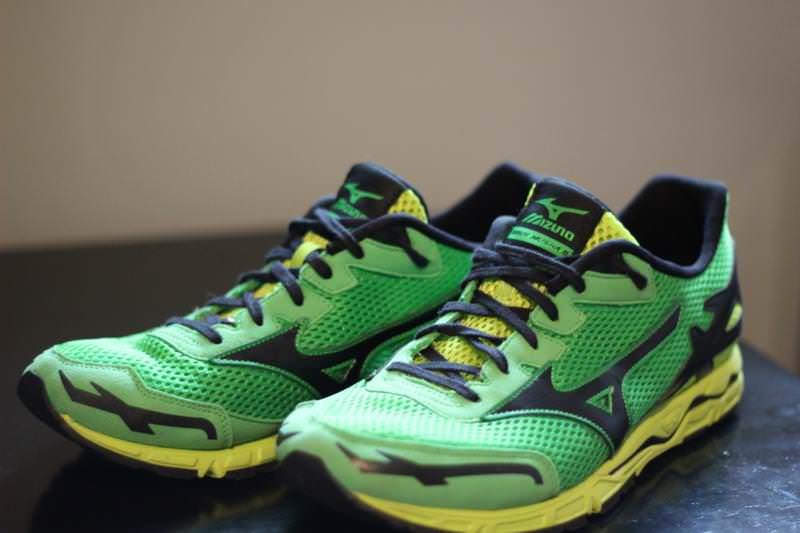 We thank the nice people at Mizuno for sending us a pair of Wave Musha 5 to test. This did not influence the outcome of the review, written after running more than 50 miles in them. Thanks for the great review of the Musha 5. I was a HUGE fan of the musha 3 because I am a mild over-pronator and found that to be the best shoe for me to prevent shin splints and other nagging aches/pains due to it’s medial support (I used my orthodics in the shoe also). However I’ve tried the musha 4 and musha 5 and have found with each successive model that it doesn’t seem to provide as much support to counteract my late pronation and I’m back to dealing with some of those nagging pains like shin splints. You mentioned that it’s a niche market…the light shoe that still provides some support. Are there other shoes that you recommend trying out that are similar to the musha 3 in being a light shoe that provides medial support? Thanks! I would like to ask for your advices. Taking my moderate overpronation into account, I started to run in Adidas Supernova Glide 4 and loved the cushioning feel of that shoes at first. However, as I started to run regularly (3-4 times a week) and have been improving myself in terms of distance and pace, having pain on my ankles and inwards of my tibia. Because of Glide 4’s heavyweight, it does not also let me accelarate as much as I want to. A fast feeling shoe with great transition. I agree the last is too curved but most racers have that problem IMO. Danny Dreyer of chi running uses it I’m told so minimalists should like it. 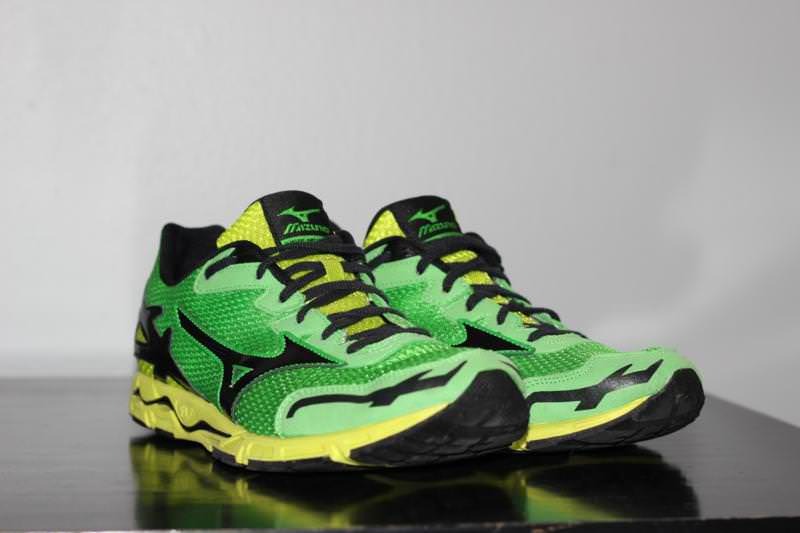 Just been for my first run in the Musha 5 (6km) and …..I love ’em! and I agree with a lot of what Theo has said – the sole is very curved, although not an issue for me as I have quite a narrow mid-foot but they are lovely and light weight, super fast and have great ground feel. I’ve never ran in such light shoes before, and compared to my Inspire 9s the shoes feel less ‘stiff’ and ‘locked in’, which for fast running is fine. However, for anything over 10km I’ll be sticking to my Inspires I think as they offer more for the bigger mileage, especially when your form suffers. No worries my friend. Hope the Musha 5 works for you. Keep us updated! So, have you raced in the Musha 5 yet? I’m an avid Inspire 9 fan and looking seriously at the Musha 5 for my summer 5 and 10k races. I’d love to hear how you’ve done racing in them. I usually hesitate to advise people on fit over the internet as everyone’s foot, and perception of fit, is different. To me, the Musha is shaped like most other Mizuno’s in that it is narrow to medium in the heel and mid foot while opening up in the toe box. Hope this helps! Nice review on the Musha 5. I tried on the Musha 4 and they felt a little too snug for me and some of the overlays didn’t feel too good wrapping my foot. I’m looking forward to these. I was in the elixir for training but had to move up to the inspire with superfeet insoles as my everyday trainer. This is because I have flat feet and over pronate more than I thought originally. I did use the musha 3 in the past. But I’ve had knee/hip problems lately. Do you think the musha 5 will be ok for me for 5k’s on the road still? What racing flats do flat footed over pronators tend to use? Also would it make sense to put my superfeet in the flats for races? Thanks Doug. I use the Musha for distances up to 10K without any insert. They should be fine with superfeet but I’ve never tried it. I think the superfeet black model might be best to pair with the Musha if need be. Good luck man! Hi Theo. Any ideas if this would be suitable for very low/flat arches. I can’t use motion control or any other of the so called “ideal for flat feet” varieties. My feet just like low inners.